It is estimated that greenhouses cover an area of about 41000 ha in the European Union, setting Europe as the biggest supplier of greenhouse products in the world. At the same time, as Eastern European markets open up, the EU is also becoming the biggest consumer of greenhouse products in the world. The competitiveness of European growers is however threatened by increasing fuel costs and competition from growers outside of Europe with lower production costs. The main contributor to production costs for European growers is from energy consumption, thus the optimisation of the energy intensive systems and operating procedures in existing greenhouse production will reduce these costs. In addition, a reduction in energy consumption will also help growers to contend with the increasingly restrictive environmental regulations that affect the sector. In this project, the greenhouse energy requirements for four different geographical areas within Europe were investigated. A tool for auditing energy efficiency in greenhouses, a set of technical improvement measures and a guideline for the optimisation of energy consumption in European greenhouses was developed and tested by a number of growers and advisors across Europe. 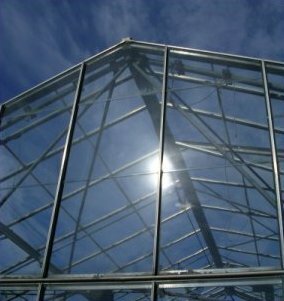 To reduce the energy consumption in existing greenhouses with small changes in configuration and operating procedures. To improve the competitiveness of European farmers and enable them to contend with increasing fuel prices and with competition from producers outside the EU. To decrease atmospheric greenhouse gas emissions and to assist growers with compliance to current and upcoming environmental regulations. To initiate the adoption of modern management strategies such as standardisation and benchmarking in the field of greenhouse agriculture. AERU was responsible for the development of the Energy Auditing Tool, developed in three parts. The structural specifications of the greenhouse and its management (‘Reference Greenhouse Specifications’) define the variables used within the ‘Core Calculation module’. The ‘Core Calculation module’ uses energy balance and crop models to allow derivation of the optimal greenhouse parameters for a given reference (baseline) greenhouse. Thirdly, the ‘Graphical User Interface module’ displays the results to the user in and easily accessible format. It allows the user to save the profile of each greenhouse they assess for comparison and running ‘what if?’ scenarios.